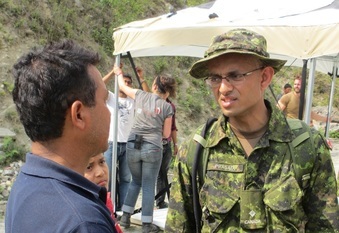 SINDHUPALCHOK, NEPAL – Second-Lieutenant Roshan Prasad, a member of the Canadian Disaster Assistance Response Team (DART), liaises with a community leader while members of the DART assist the non-governmental organization Global Medic and local villagers on May 13, 2015 to set up community tents at Sukute Lower Secondary School, Sindhupalchok Region, Nepal, after the school was destroyed during an earthquake. 2Lt Prasad has served for the last two years as a Canadian Armed Forces Reserve Artillery Officer. He is currently employed in this role at 15 Field Artillery Regiment, The Royal Regiment of Canadian Artillery, Vancouver, B.C. He deployed as part of the DART to help in Nepal and arrived in Kathmandu on May 9, 2015. Although currently living in Surrey, B.C., he was born in Northern India and can speak the local dialects. He also understands the culture in Nepal and this allowed him to volunteer to serve as a Language and Cultural Assistant (LCA) for the DART. In this role he acts as a translator and advises the DART on culturally sensitive issues. 2Lt Prasad’s efforts to support the members of DART have been crucial to ensuring the overall success of the mission. 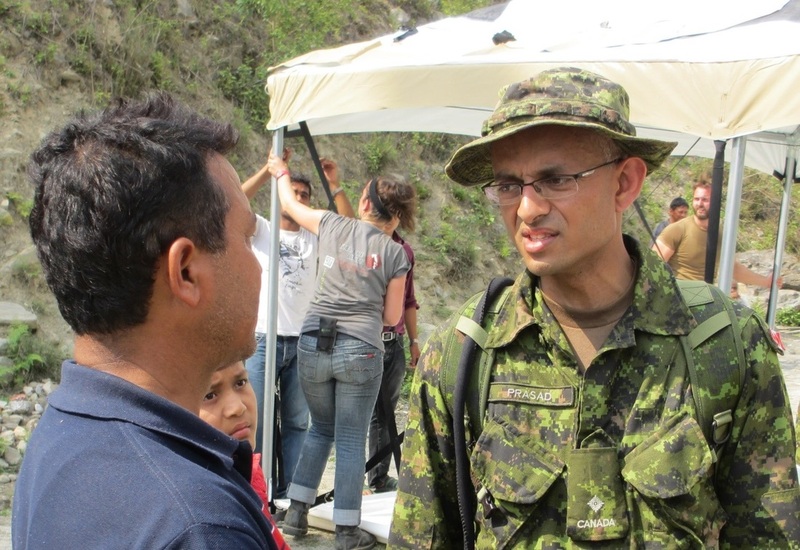 Canada is supporting the government of Nepal as it rebuilds and enhances it capacity to respond to the disaster. The DART is equipped to conduct emergency relief operations for up to 40 days, until local authorities, national organizations and international aid-agencies are able to sustain long-term recovery efforts. Working alongside local authorities and humanitarian relief partners, DART acts as a stabilization measure until regular services are restored.